Recently I came across an unexpected surprise at Seattle's Bauhaus Coffee: individually foil-wrapped Ding Dongs for just $1 each. Naturally this was a source of excitement--it's always exciting to find a homemade version of junk food! Well, upon inquiring further, it turns out that the pastries themselves are nothing of serious note: per the employee I spoke to, they are, in fact, just the commercially made Hostess variety, re-packaged in foil. 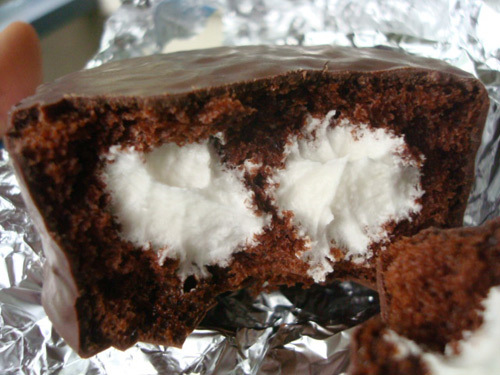 A Ding Dong is a chocolate cake that is sold by Hostess Brands. It is round with a flat top and bottom, about three inches in diameter and a little more than an inch high, similar in shape to a hockey puck. A white creamy filling is injected into the center, and a thin coating of chocolate glaze covers the entire cake. 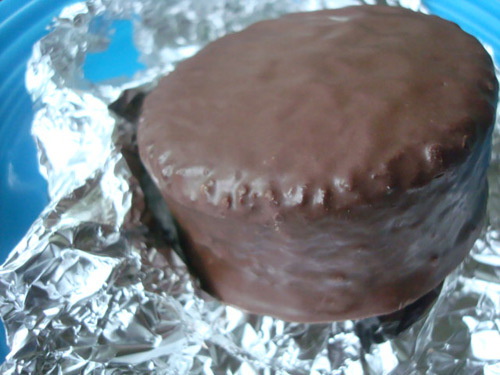 The cake was originally wrapped in a square of thick aluminum foil, enabling it to be carried in lunches without melting the chocolate glaze. 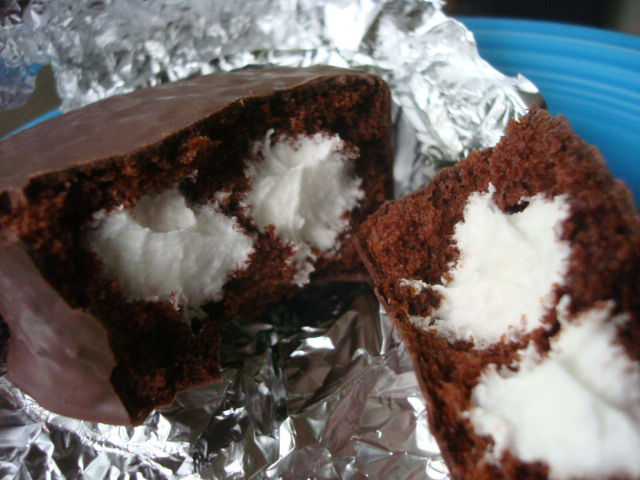 The Ding Dong is similar to other cream-filled cakes, such as Arcade Vachon's Jos. Louis introduced before 1934 and still in production. Hostess began marketing their Ding Dong in 1967. The name was given to coincide with a television ad campaign featuring a ringing bell. The company marketed the snacks on the East Coast as Big Wheels, to avoid confusion with the Ring Ding, a similar (and pre-existing) treat by Drake's Cakes. The names were consolidated in 1987, when a short-lived merger of Drake's with Hostess' parent company (then Continental Baking Company) briefly resolved the Ring Ding/Ding Dong conflict. When the merged company broke up, however, Hostess was forced to cease, once again, using the Ding Dongs name in areas where Ring Dings were available. The compromise sound-alike name King Dons lasted untilInterstate Bakeries Corporation, which had recently merged with Hostess' parent company, bought Drake's in 1998. The Hostess product is now sold under the name Ding Dongs throughout the United States. However, the snack is still sold as the King Don in Canada. The name Ding Dong came from the chiming bells used in Hostess' first television commercials and you'll be singing a happy tune every time you polish off a package. Nibble them slowly, like a king or queen, and savor the creamy goodness of every morsel, or bite right into that creamy center and get a mouthful of chocolate goodness. For more, check out the official Ding Dong page on the Hostess website!